Babies act, smell, and behave a lot differently than humans. Dogs can be a little put off and not necessarily in a bad way. But it is a new experience for them and introducing them to your new baby is something that needs to be done carefully and with patience in mind. Here are some tips to safely introduce your dog to a new baby. Your dog should have an enjoyable experience with a new baby the moment he sees it. When you bring the baby home, make sure everyone he’s used to seeing enters first. This is to make sure all of that excitement is out before the baby is actually in the house. Have your dog leashed, even if your dog is the nicest on the block. And stay calm. Have plenty treats as a reward for any calm reaction your dog has toward the baby. Try to avoid scolding. Doing so will associate the baby with negative behavior. It should be a very positive experience. When letting your dog investigate the new baby, you want to make sure it’s in a quiet room. Have someone leash and hold your dog and make sure to have the baby cradled in your arms. 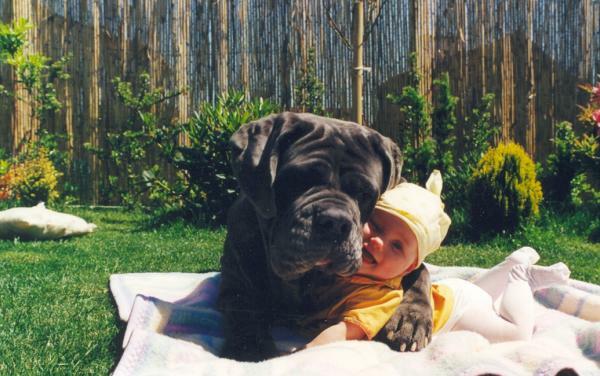 Make sure when you invite your dog to approach the baby, it’s in a calm, gentle tone. If you’re comfortable with it, allow your dog to sniff the baby, but continue to do so while talking to him gently. Introducing your dog to a new baby is something that makes a lot of parents nervous and for good reason. It’s understandable as animals can be unpredictable, regardless of how well you know them. So take this slow. Make it a deliberate process to help your dog interact with your little one. If long interactions don’t make you very comfortable, try brief ones throughout the day. You’re still getting some introduction time in, but at a pace with which you’re most comfortable. « Are Two Pets Better than One? Interesting read. When I was pregnant with my first child, Sara I used a book called Tell Your Dog You’re Pregnant: An essential guide for dog owners who are expecting a baby. It was really helpful and came with a baby sounds and toy noises. Max (my fur child!) took some time to get used to the sounds but the book helped on how to do it. It gave me advice on what changes will occur and how to prepare my Max for them. It also talked about the causes for aggression and why it might occur and how to avoid it. It is written by a vet behaviorist too so it cover health issues as well – I got it from http://www.babyandpet.com.au or Amazon too i guess – mayb that will help someone else!